Verapamil. Verapamil, 5-[(3,4-dimethoxyphenethyl) methylamino]-2-(3,4-dimethoxyphenyl)-2-isopropylvalero-nitrile (Calan, Isoptin), was introduced in 1962 as a coronary vasodilator and is the prototype of the Ca2+ antagonists used in cardiovascular diseases. It is used in the treatment of angina pectoris, arrhythmias from ischemic myocardial syndromes, and supraventricular arrhythmias. Verapamil's major effect is on the slow Ca2+ channel. The result is a slowing of AV conduction and the sinus rate. This inhibition of the action potential inhibits one limb of the reentry circuit believed to underlie most paroxysmal supraventricular tachycardias that use the AV node as a reentry point. It is categorized as a class IV antiarrhythmic drug (see "Classes of Antiarrhythmic Drugs" later in this chapter). Hemodynamically, verapamil causes a change in the preload, afterload, contractility, heart rate, and coronary blood flow. 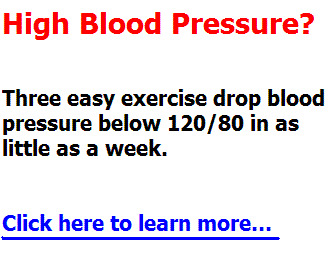 The drug reduces systemic vascular resistance and mean blood pressure, with minor effects on cardiac output. Verapamil is a synthetic compound possessing slight structural similarity to papaverine. It can be separated into its optically active isomers, of which the levorotatory enan-tiomer is the most potent. It is absorbed rapidly after oral administration. The drug is metabolized quickly and, as a result, has low bioavailability. The liver is the main site of first-pass metabolism, forming several products. The preferential metabolic step involves N-dealkylation, followed by O-demethylation, and subsequent conjugation of the product before elimination. The metabolites have no significant biological activity. Verapamil has an elimination half-life of approximately 5 hours. 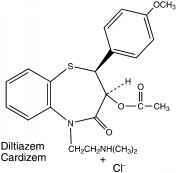 Diltiazem Hydrochloride. Diltiazem hydrochloride, ( + )-czs-3-(acetoxy)-5-[2(dimethylamino)ethyl]-2,3-dihy-dro-2-(4-methoxyphenyl)1,5-benzothiazepin-4(5H)one hydrochloride (Cardizem), was developed and introduced in Japan as a cardiovascular agent to treat angina pectoris. 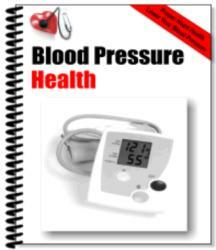 It was observed to dilate peripheral arteries and arterioles. The drug increases myocardial oxygen supply by relieving coronary artery spasm and reduces myocardial oxygen demand by decreasing heart rate and reducing overload. Diltiazem hydrochloride is used in patients with variant angina. The drug has electrophysiological properties similar to those of verapamil and is used in clinically similar treatment conditions as an antiarrhythmic agent, but it is less potent. The drug is absorbed rapidly and almost completely from the digestive tract. It reaches peak plasma levels within 1 hour after administration in gelatin capsules. Oral formulations on the market are sustained-release preparations providing peak plasma levels 3 to 4 hours after administration. Diltiazem hydrochloride is metabolized extensively after oral dosing, by first-pass metabolism. As a result, the bioavailability is about 40% of the administered dose. The drug undergoes several biotransformations, including deacetylation, oxidative O- and N-demethylations, and conjugation of the phenolic metabolites. Of the various metabolites (Fig. 19.8), only the primary metabolite, deacetyldiltiazem, is pharmacologically active. Deacetyldiltiazem has about 40% to 50% of the potency of the parent compound. (Adalat, Procardia), is a dihydropyridine derivative that bears no structural resemblance to the other calcium antagonists. It is not a nitrate, but its nitro group is essential for its antianginal effect.17 As a class, the dihydropyridines possess a central pyridine ring that is partially saturated. To this, positions 2 and 6 are substituted with an alkyl group that may play a role in the agent's duration of action. In addition, positions 3 and 5 are carboxylic groups that must be protected with an ester functional group. Depending on the type of ester used at these sites, the agent can be distributed to various parts of the body. Finally, position 4 requires an aromatic substitution possessing an electron-withdrawing group (i.e., Cl or NO2) in the ortho and/or meta position. The prototype of this class, nifedipine, has potent peripheral vasodilatory properties. It inhibits the voltage-dependent calcium channel in the vascular smooth muscle but has little or no direct depressant effect on the SA or AV nodes, even though it inhibits calcium current in normal and isolated cardiac tissues. Nifedipine is more effective in patients whose anginal episodes are caused by coronary vasospasm and is used in the treatment of vasospastic angina as well as classic angina pectoris. Because of its strong vasodilatory properties, it is used in selected patients to treat hypertension. Figure 19.8 • Biotransformations of diltiazem. Figure 19.9 • Nifedipine metabolism. 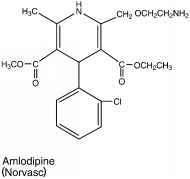 Amlodipine. Amlodipine, 2-[(2-aminoethoxy)methyl]4-(2-chlorophenyl)-1,4-dihydro-6-methyl-3,5-pyridinedicar-boxylic acid 3-ethyl 5-methyl ester (Norvasc), is a second-generation 1,4-dihyropyridine derivative of the prototypical molecule nifedipine. Like most of the second-generation dihydropyridine derivatives, it has greater selectivity for the vascular smooth muscle than myocardial tissue, a longer half-life (34 hours), and less negative inotropy than the prototypical nifedipine. Amlodipine is used in the treatment of chronic stable angina and in the management of mild-to-moderate essential hypertension. It is marketed as the benzene sulfonic acid salt (besylate). Amlodipine was approved in September 2007 as a combination product with olmesartan (Azor), an angiotensin II receptor antagonist (Chapter 18), for the treatment of hypertension. Amlodipine is also marketed as a combination therapy with atorvastatin under the tradename Norvasc for the management of high cholesterol and high blood pressure. Felodipine. Felodipine, 4-(2,3-dichlorophenyl)-1,4-di-hydro-2,6-dimethyl-3,5-pyridinedicarboxylic acid ethyl methyl ester (Plendil), is a second-generation dihydropyridine channel blocker of the nifedipine type. It is more selective for vascular smooth muscle than for myocardial tissue and serves as an effective vasodilator. The drug is used in the treatment of angina and mild-to-moderate essential hypertension. Felodipine, like most of the dihydropyridines, exhibits a high degree of protein binding and has a half-life ranging from 10 to 18 hours. Isradipine. Isradipine, 4-(4-benzofuranazyl)-1,4-dihy-dro-2,6-dimethyl-3,5-pyridinecarboxylic acid methyl 1-methylethyl ester (DynaCirc), is another second-generation dihydropyridine-type channel blocker. This drug, like the other second-generation analogs, is more selective for vascular smooth muscle than for myocardial tissue. It is effective in the treatment of stable angina, reducing the frequency of anginal attacks and the need to use nitroglycerin. Nicardipine Hydrochloride. 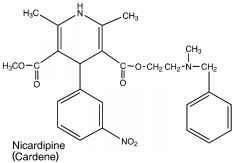 Nicardipine hydrochloride, 1,4-dihydro-2,6-dimethyl-4-(3-nitrophenyl)-3,5-pyridinedi-carboxylic acid methyl 2-[methyl(phenylmethyl)amino]ethyl ester hydrochloride (Cardene), is a more potent vasodilator of the systemic, coronary, cerebral, and renal vasculature and has been used in the treatment of mild, moderate, and severe hypertension. The drug is also used in the management of stable angina. 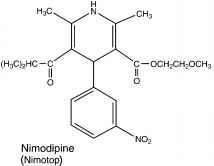 Nimodipine. 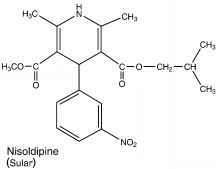 Nimodipine, 1,4-dihydro-2,6-dimethyl-4-(3-nitrophenyl)- 3,5-pyridinedicarboxylic acid 2-methoxy-ethyl 1-methylethyl ester (Nimotop), is another dihydropyridine calcium channel blocker but differs in that it dilates the cerebral blood vessels more effectively than do the other dihydropyridine derivatives. This drug is indicated for treatment of subarachnoid hemorrhage-associated neurological deficits. Nisoldipine. In vitro studies show that the effects of nisoldipine, 1,4-dihydro-2, 6-dimethyl-4-(2-nitrophenyl)-3,5-pyridinecarboxylic acid methyl 2-methylpropyl ester (Sular), on contractile processes are selective, with greater potency on vascular smooth muscle than on cardiac muscle. Nisoldipine is highly metabolized, with five major metabolites identified. As with most of the dihydropy-ridines, the cytochrome P450 (CYP) 3A4 isozyme is mainly responsible for the metabolism of nisoldipine. The major biotransformation pathway appears to involve the hydroxyl-ation of the isobutyl ester side chain. This particular metabolite has approximately 10% of the activity of the parent compound. 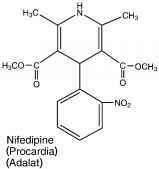 Nitrendipine. 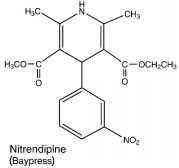 Nitrendipine, 1,4-dihydro-2,6-dimethyl-4-(3-nitrophenyl)-3,5-pyridinecarboxylic acid methyl ethyl ester (Baypress), is a second-generation dihydropyridine channel blocker of the nifedipine type. It is more selective for vascular smooth muscle than for myocardial tissue and serves as an effective vasodilator. The drug is used in the treatment of mild-to-moderate essential hypertension. generation alkylamine-type channel blocker, structurally unrelated to the dihydropyridines. Its actions are less specific than those of the three prototypical channel blockers, verapamil, diltiazem, and nifedipine. In addition to being a Ca2+ channel blocker, it inhibits sodium flow into the heart tissue and lengthens cardiac repolarization, causing bradycardia. Caution should be used if it is given to a patient with hypokalemia. Bepridil hydrochloride is used for stable angina. The drug has a half-life of 33 hours and is highly bound to protein (99%).